If you want to score big, you need to think big. Whenever you have a whole team to feed, or maybe even the league, you need to get things ready in advance. In this case, that means overnight. This big porchetta will feed your whole squad. And if one is not enough, make two. 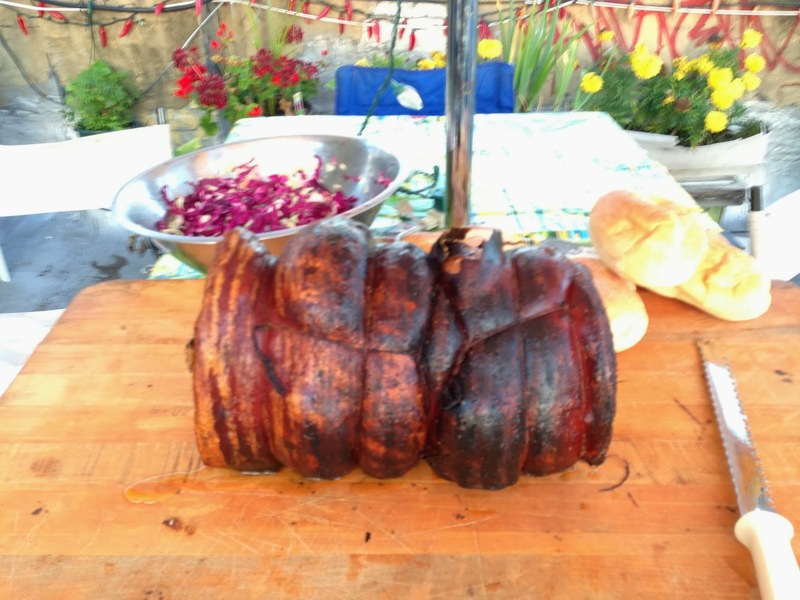 So, what is a porchetta? It is a moist boneless pork roast that is an Italian culinary tradition. It combines a pork belly and pork loin. It’s rolled together, seared and then roasted. 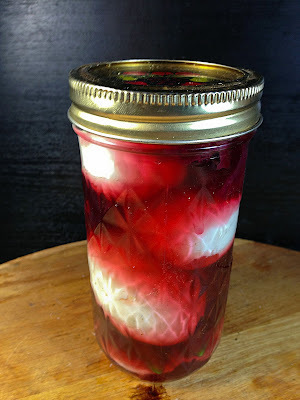 This post was originally posted here July 26, 2013 - follow the link to get the full recipe. In a Pickle - CCC - Creative Cooking Crew made the challenge "pickle"
Green eyed green horned flying purple pickle eater - is that how the song goes? Well if it doesnt I made some purple pickles for nothing. This is an easy recipe that you can make in less than 24 hours. 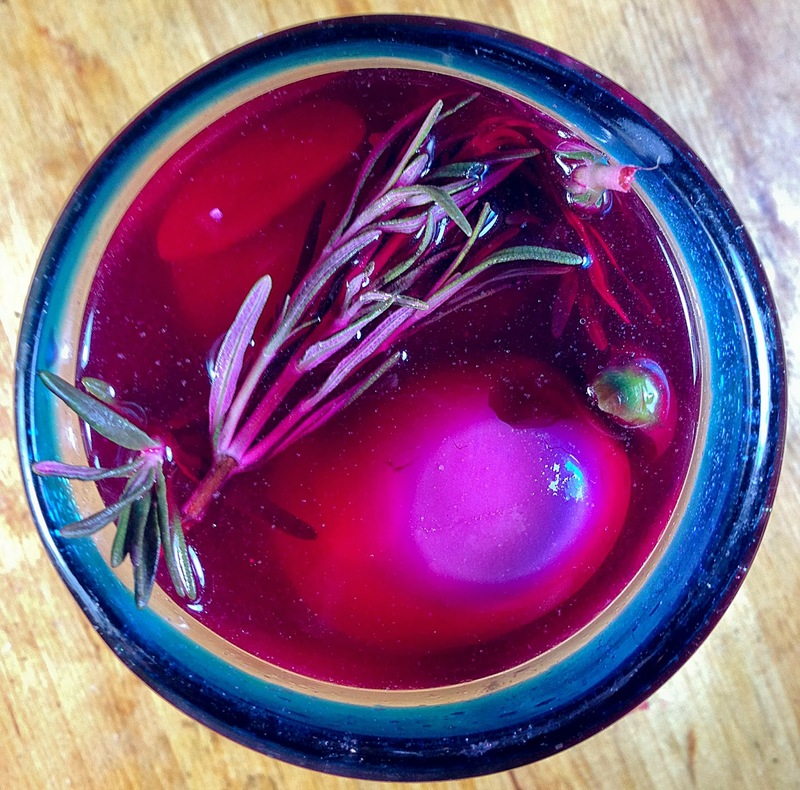 Boil some beets until soft. Boil some eggs until they are at your desired state of semi-hard boiled. Put eggs in a glass or a jar or a bowl and add sliced garlic, rosemary, hot green chile and then cover halfway with the hot boiling liquid from the beets and then cover completely with white vinegar, add a slice or two of fresh beet to kick up the color and set aside 6 hours or over night. 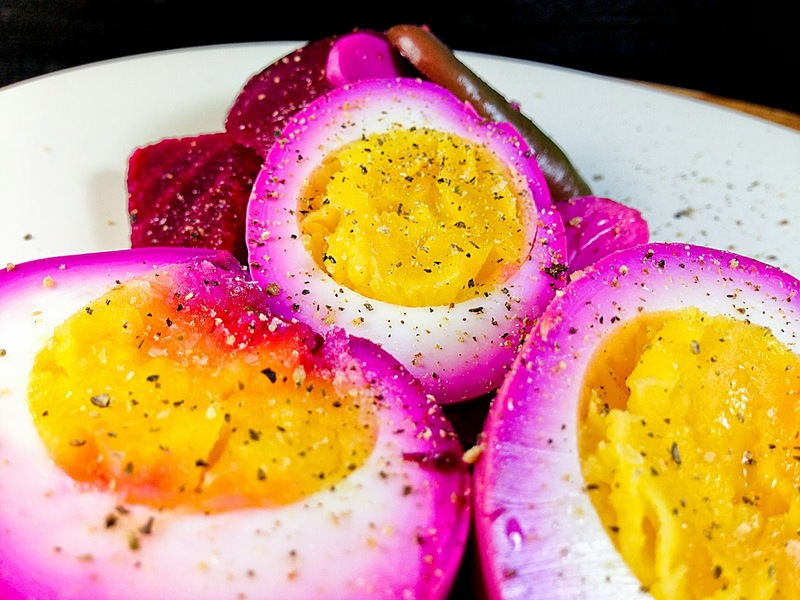 You dont want to leave the eggs in the pickling agent for too long or they will become like bouncing rubber balls, so this is something that you can add eggs too often and eat often. 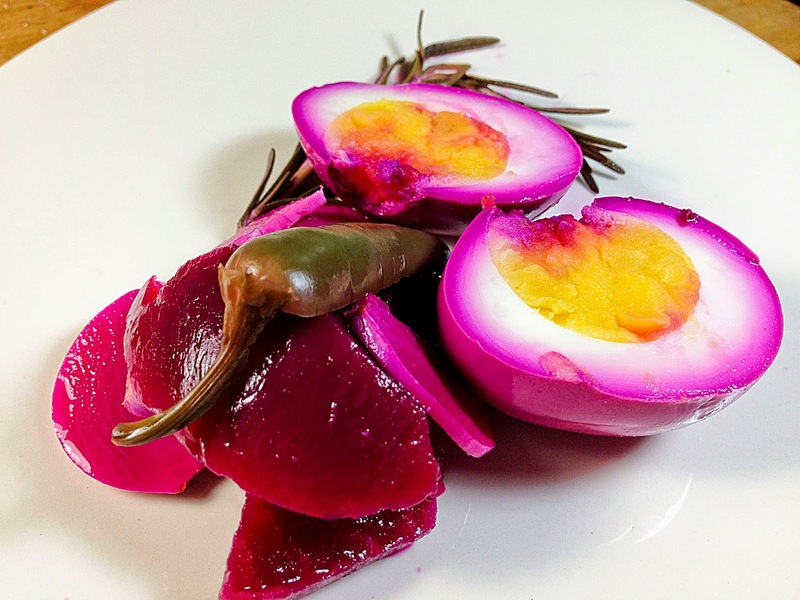 There are probably a few bars around New York City that still have a big jar of these pickled eggs behind the bar for the hungry beer drinker that wants a little pickled nutrition while he pickles himself but I dont thing there are any that offer purple pickled eggs. I made these once (not pickled but colored with beet juice) and turned them into deviled eggs for a breast cancer awareness event. 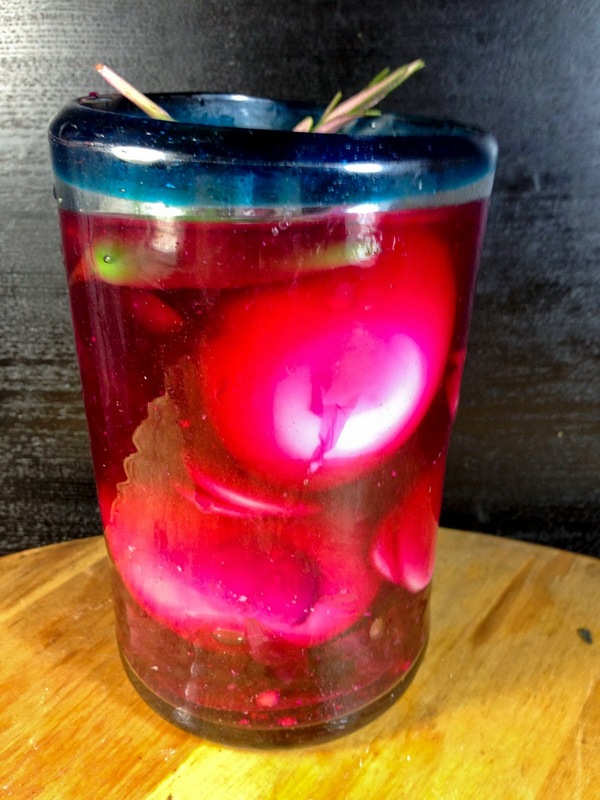 Check out the others and lets see what got pickled.